Learn how to create this graph from this tutorial. 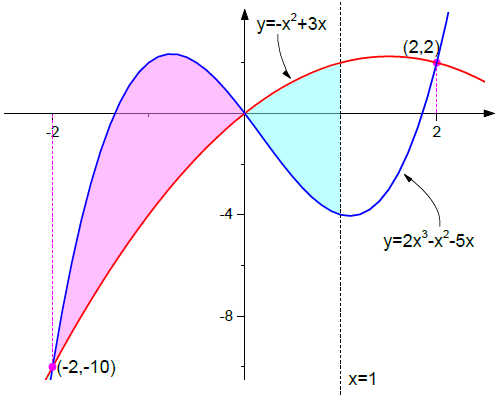 This is a graph of two plotted functions. The graph demonstrates Origin's Fill Area Under Curve > Fill to next data plot - Above Below Colors feature. Enabling this option fills the area between two plots, fill color being dependent upon which is greater: 2x3-x2-5x or -(x)2 + 3x. The unfilled area where x≥1 is accomplished by plotting those portions of the two functions separately.